I’ll let you in on one of my secrets: no matter how swamped I’ve ever been in one of my literature classes, I’ve always made time to read comic books. They keep my brain sane and entertained. I started reading comic books when I was 8 years old and found boxes of my mom’s old Archie comics in my grandpa’s attic: and I’ve been on the lookout for new titles ever since. So imagine my excitement at getting to review the debut issue of Man Of The Hour, from Dave Alluisi with art by Jesus Marquez. Read on to see what I thought! 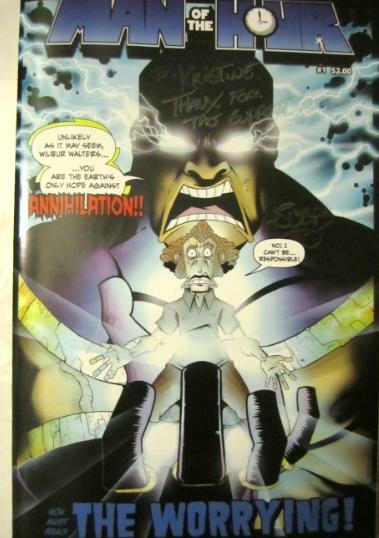 I met artist Jesus Marquez at a comic event: check out my autographed copy of Man Of The Hour! Let’s just say Man Of The Hour was $2 well spent! The story opens with an apathetic, disbelieving reporter in pursuit of a story that she’s recording on her iPhone. Okay, way to be 100% relevant to my interests right out of the gate. I have definitely interned with this girl. (In contrast, I’m an overeager interviewer who hauls around a notebook. Like a paper one.) She’s trying to meet up with the mysterious Wilbur Walters, who will try very desperately to explain how he turned into The Minute Man, a not-so-super hero who manages to cause more havoc than he can prevent. I like the underlying classic story of an average guy turning into a superhero, but in Wilbur’s case, he started off as a below average loser and has barely taken the step up into average territory, even with his crazy twist of fate. I get the feeling that getting abducted by aliens and being transformed into an unexplainable creature is the most exciting thing that could happen to poor Wilbur: but it seems like nobody believes he can do much of anything. I was entertained by pretty much every aspect of the comic: from the plot (that, despite being a theme we’re accustomed to, is far from stale) to the characters’ spot-on facial expressions. My absolute favorite part of the book is the clever “that’s what she said” double entendres, accentuated by this goofy guy spitting out his beverage in the background. Every. Single. Time. Can this guy please be a recurring character? He’s “girl in pink dress dancing” from Rebecca Black’s “Friday” video: the part you focus on most the second (or third, or fourth) time around. I can’t wait for the next installment to see what clumsy adventures Wilbur finds himself involved in. To pick up a copy and keep in the loop, check out JesusMarquez.com or follow Dave & Jesus on Twitter @GreenInkEdits and @TheJesusMarquez.